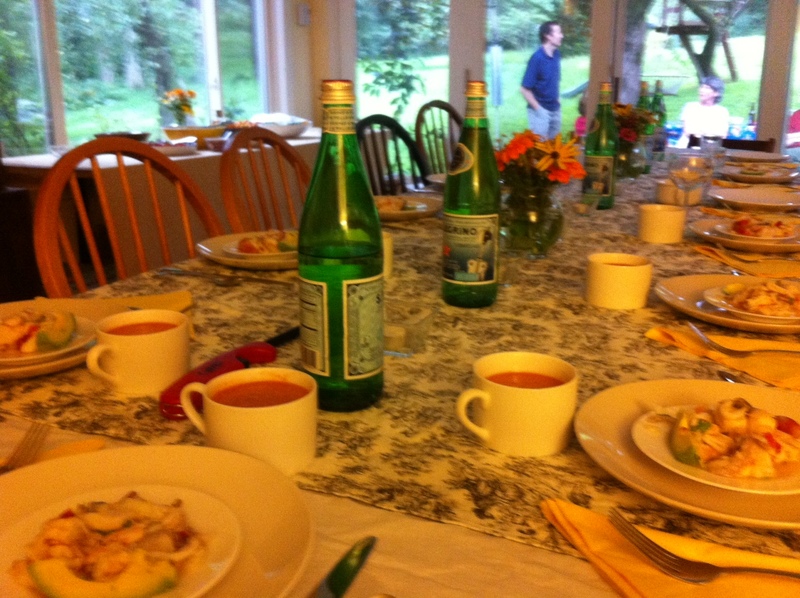 Feasting on sea and garden bounty in Conn. 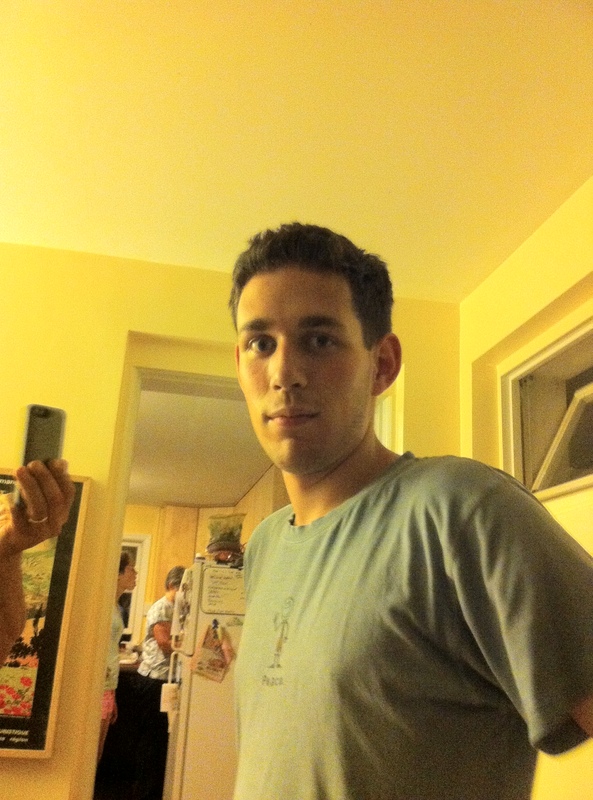 Celebrating anything at the home of my sister Calico and her family in the New Haven suburb where they live is always über festive, from their annual elegant Bastille Day sit-downs to their rollicking Oktoberfests. But last night’s dinner to celebrate Calico’s half-century mark was something special indeed, with plenty of amazing food, drink and merriment. Glasses of Jaume Serra Cristallino Brut cava, pistachios, beer nuts, and rosemary-spiked marcona almonds started things off right. Then the table was set with a perfectly balanced tangy and smooth gazpacho and small plates of a zesty ceviche of monkfish, scallops and squid, gilded with avocado slices. 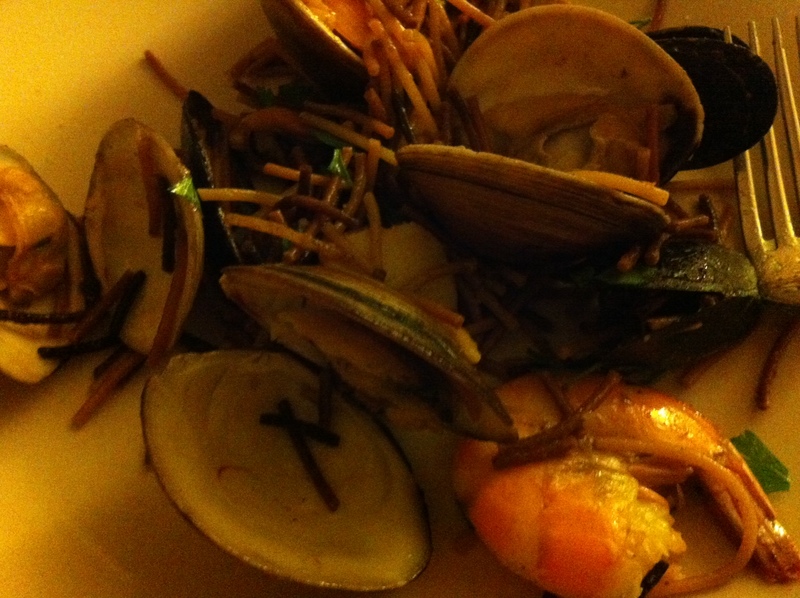 Appetites piqued, we moved on to enjoy Mig’s fideua, a sort of Catalan paella with toasted pasta instead of rice. Fideua, a pasta-based cousin of paella. 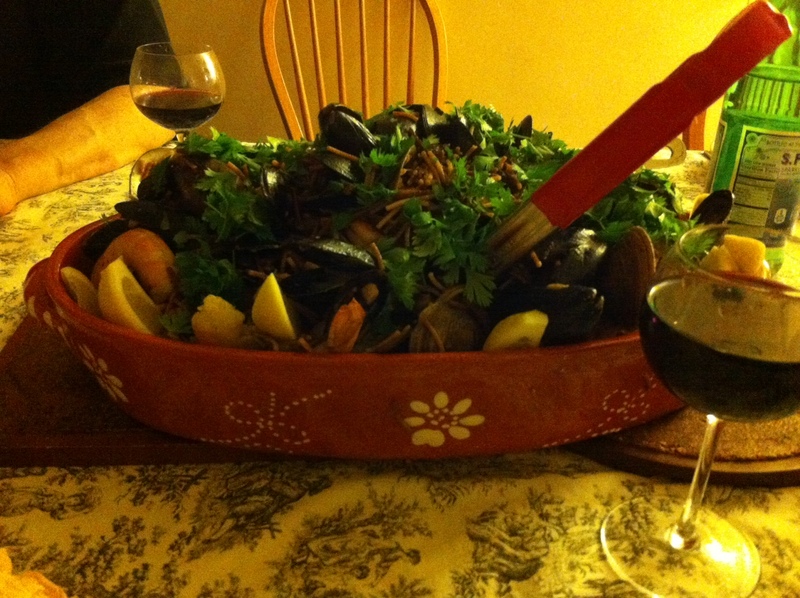 This one was well-crafted and bursting with clams, mussels, and shrimp and a rich saffron garlic flavor. Garden bounty on the side. 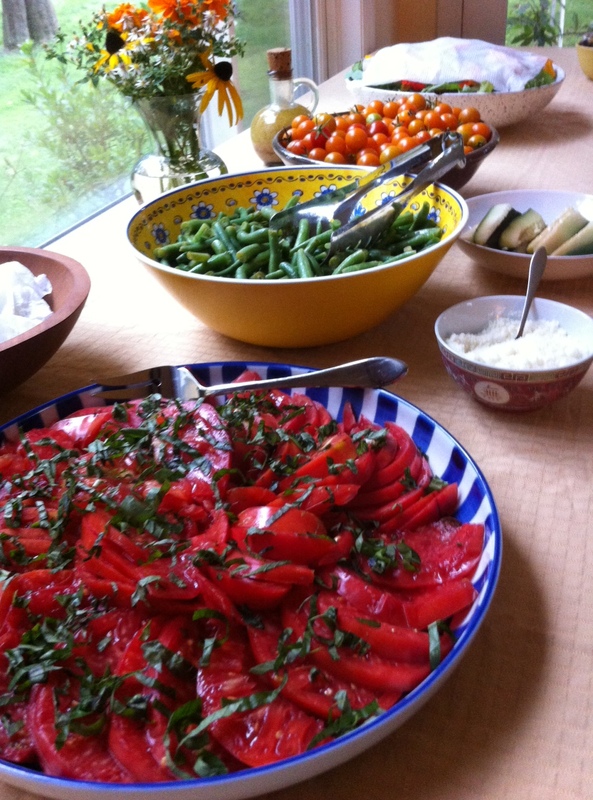 Sides included a beautiful nasturtium salad and tomatoes fresh from the garden. My favorite Spanish red Marques de Caceres was on hand, along with an assortment of other fine examples. Dessert was a collection of several excellent Spanish cheeses served with quince paste, digestifs from chartreuse to calvados to pear williams to Branca Menta. 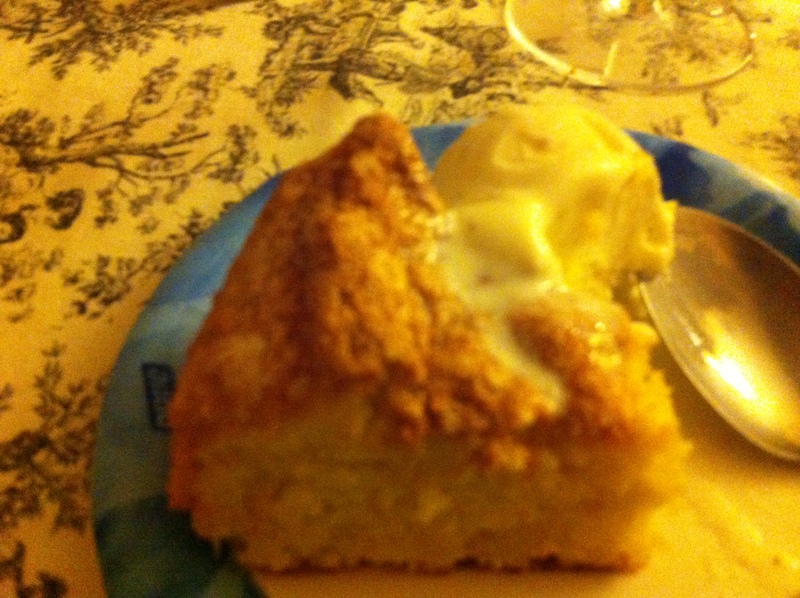 Finally there was a soft moist and delectable almond cake made by the chef. Almond cake with ice cream. I was happy to see my mother on hand for the occasion, as well as my nephew Miles home from his sophomore year at UConn Storrs. Happy 50th, Calico! !